As the rates of new heroin users increase across the U.S. and the demographics of heroin use continue to shift, the need to focus on the harms associated with heroin abuse is higher than ever. One reason that heroin is so potent and effective at producing a response is its metabolic activity. Heroin is lipophilic (“lipid-loving”), which means that it can cross the blood-brain barrier more efficiently than its hydrophilic (“water-loving”) metabolite, morphine. Heroin’s lipophilicity manifests itself as rapid Central Nervous System (CNS) absorption, leading to fast onset of effects. Warm flushing of the skin. After the initial effects of heroin subside, users may feel drowsy for several hours, with decreased mental and cardiac function. Because of the desired euphoric rush and the developed tolerance to heroin, unintentional overdose is possible. The most serious danger of an overdose, which leads to death if left untreated, is severe respiratory depression. As discussed below, respiratory depression can cause hypoxic brain injuries if left untreated, and often, opioid antagonists (such as naloxone) that reverse the effects of heroin are required in the Emergency Department. 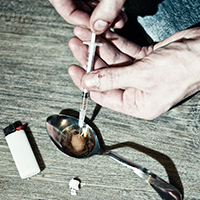 Chronic heroin use can lead to a number of complications, including those related to the route of administration of heroin (for example, bacterial infections and infectious diseases) as well as those related to the effects of heroin itself (for example, overdose consequences and respiratory depression). Heroin is administered primarily via the intravenous (IV) route, due to the euphoric “rush” that is felt with this route; however, there is a high risk of infection when injecting drugs into the veins. IV heroin users who do not obtain clean needles for their injections are at extremely elevated risk for contracting HIV/AIDS, hepatitis, and other infections such as bacterial endocarditis or mycoses (fungal infections). Due to repeated venous access, vascular collapse may also occur. Permanent changes to the brain can occur with chronic heroin use. Permanent changes to the brain can occur with chronic heroin use, even after stopping use. Several studies have shown that long-term heroin users exhibited generalized cerebral atrophy (tissue wasting), focal neurological deficits, and changes to neurotransmitter signaling pathways in the brain. Hypoxic brain injuries may also occur as a result of severe respiratory depression associated with overdose. It is generally understood that pure heroin has fewer long-term effects on the body as heroin that is “cut” with impurities, which are frequently responsible for some of the severe neurological deficits seen with chronic heroin use. The health risks of heroin are hard to ignore. Call 1-888-993-3112Who Answers?, day or night, to speak confidentially with someone about available heroin addiction treatment program options. Once a heroin user has been administering the drug for a period of time, cravings for heroin can develop. Cravings are a subjective experience that can be described as a heightened desire for heroin while being heroin-abstinent. Heroin cravings can actually cause an abstinent recovering user to abandon treatment and trigger a relapse. Cravings can occur because of environmental triggers that remind the user of a time when he was using heroin. While there aren’t any specific anti-craving medications on the market, pharmaceutical companies are researching this as a treatment option. There are two types of dependence: physiological and psychological. Physiological dependence is defined as the body’s adaptation to the presence of the drug. Without heroin present in the body, the user will begin to experience severe withdrawal symptoms (including cravings and a propensity for relapse). Psychological dependence is typically described when a user feels a compulsive need to take the drug because of the “way it makes him feel.” Heroin-dependent users may feel that without the drug, they cannot function in their everyday lives. Tolerance to heroin occurs when the user must take increasingly higher doses to achieve the same effect. Tolerance develops over a period of time and worsens as the heroin use continues. Because of the increased amount of drug required for the desired effect, users are at higher risk of unintentional overdose with accompanying respiratory depression. Tolerance may be one of the most severe consequences of heroin use in terms of associated harms. If a heroin user abruptly stops using the drug (called “cold-turkey” cessation), withdrawal symptoms begin with 6-24 hours of the last dose of heroin. These symptoms are very unpleasant and often lead a user to begin taking heroin again to alleviate the withdrawal syndrome. These symptoms may be more or less severe depending on the level of tolerance and degree of dependence. Generally, heroin withdrawal is not life threatening and will subside with time. 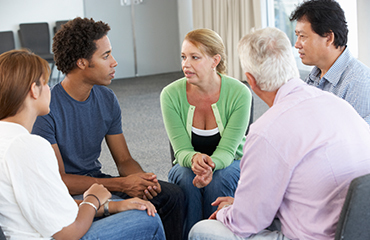 Find a Meeting Narcotics Anonymous is a 12-step program that helps those struggling with addiction to heroin and other drugs. Find a local meeting for you or your loved one. Heroin addiction has a tendency to isolate a user from his non-using friends, damaging relationships with both friends and family. Historically, heroin users have trouble keeping their job or staying in school, because those two activities cannot be done while using heroin. Because of the difficulties keeping a job, heroin users often find themselves in need of money to support their habit, and may turn to a life of crime to obtain heroin. Not only can heroin use adversely affect a user's quality of life, it can have unintended consequences for pregnant women and their unborn children. Studies have shown that heroin use during pregnancy puts the fetus at a significantly increased risk of spontaneous abortion. Many of these children spend time in the neonatal intensive care unit (NICU) to receive treatment and may have developmental delays as they enter childhood. Heroin use and abuse can quickly disrupt all facets of one’s life. Substance abuse treatment can help put an end to the seemingly endless cycle of craving and withdrawal, and help restore balance and health. To find out more about heroin detox programs or heroin addiction recovery, please call 1-888-993-3112Who Answers? and speak with one of our trusted support advisors. The rate of mental health disorders among the population of heroin users is significantly higher than the general population. It is not uncommon for a substance abuser to have a concurrent mental health condition, and among heroin users, depression, anxiety, and personality disorders are highly prevalent. Having a co-morbid diagnosis of depression increases a user's risk of overdosing on heroin. Comorbid psychiatric disorders have been shown to have an adverse effect on users seeking treatment for heroin addiction. For example, having a comorbid psychiatric diagnosis increased the risk of hospitalization for drug-related issues in a 2011 study of heroin users seeking treatment in the form of naltrexone implants or methadone maintenance. The “chicken-and-egg” paradigm is valid with mental health disorders, as it is incredibly difficult to tell whether the psychiatric diagnosis came first, followed by heroin addiction or the other way around. Having a comorbid psychiatric condition can also impact a heroin user’s quality of life, further distancing him from favorite activities, friends, family, work, and school-related functions. Depression, for example, can compound with the spiraling effects of heroin dependence and create a quality of life that is far inferior to that of a heroin user devoid of any mental health problems. 1. Büttner, A., Mall, G., Penning, R., & Weis, S. (2000). The neuropathology of heroin abuse. Forensic Science International, 113(1), pp. 435-442. 2. Fareed, A., Vayalapalli, S., Casarella, J., Amar, R., & Drexler, K. (2010). Heroin anticraving medications: a systematic review. The American Journal of Drug and Alcohol Abuse, 36(3), pp. 332-341. 3. Ngo, H. T. T., Tait, R. J., Hulse, G. K. (2011). Hospital psychiatric comorbidity and its role in heroin dependence treatment outcomes using naltrexone implant or methadone maintenance. Journal of Psychopharmacology, 25(6), pp. 774-782. 5. Zheng, T., Liu, L., Aa, J., Wang, G., Cao, B., Li, M., … Zhu, X. (2013). Metabolic phenotype of rats exposed to heroin and potential markers of heroin abuse. Drug and Alcohol Dependence, 127(1-3), pp. 177-186.